The Hon’ble Chairman of University Grants Commission, New Delhi, Prof Ved Prakash and Shri Kiren Rijiju, the Hon’ble Union Minister of States for Home Affairs had addressed the Vice-Chancellors of Central, State as well as Private Universities and Principal of few Prominent Colleges of North East Region through an Interactive Session organized by University of Science & Technology, Meghalaya in association with Rashtriya Institute of Skill and Education (RISE) on 11th March 2016. While addressing the VC’s and Principals, Shri Rijiju said that skill development training and linkage between universities and industries are important in Northeast region to eradicate unemployment. He further stressed on the need of industry based training in the universities. Shri Rijiju also encouraged the universities to adopt villages nearby their own establishment for the overall socio economic growth of the country. 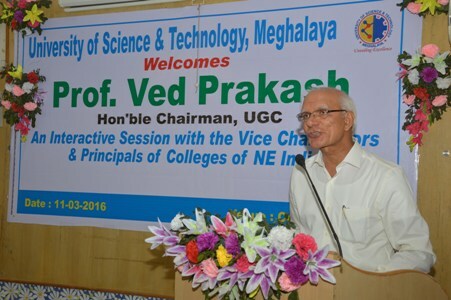 Prof Ved Prakash, during his interaction with the VC’s and principals from various colleges of Northeast said that, if a university want to be the best all the departments should perform equally and education must be the priority for the varsity. Prof Ved Prakash stressed that the universities should provide additional facilities for the students and diversifies the curriculum, so that our students can cope up with the present job market. The UGC Chairman further encouraged the Vice Chancellors to set the goal for coming five years and keep monitoring the growth of the university. Prof Ved Praksh also stressed on the importance of entrepreneurship training at the universities. During the interactive session the Vice Chancellors and Principals discussed and shared the problems related to the higher educational institutions in Northeast with Prof Ved Prakash, and he responded with expert comments for the betterment of educational scenario in the days to come. Prof Mihir Kanti Chaudhuri, Hon’ble Vice Chancellor, Tezpur University presided over the interactive session and shared his view for the same. The Vice-Chancellors of more than 20 central, state and private Universities along with more than seventy Principals of renowned colleges of Northeast were present in the program. Saikia, CCSU; Prof. (Dr.) Vijender Kumar, VC, NLU; and many more. The VC’s who were unable to attend the meet due to unavoidable circumstances had deputed the higher authorities of their esteem university to attend the interaction. Earlier, Shri Kiren Rijiju, the Hon’ble Union Minister of States for Home Affairs had inaugurated the Social Science Block of USTM and interacted with especially the large number students of Arunachal Pradesh at present studying at USTM and RIST.